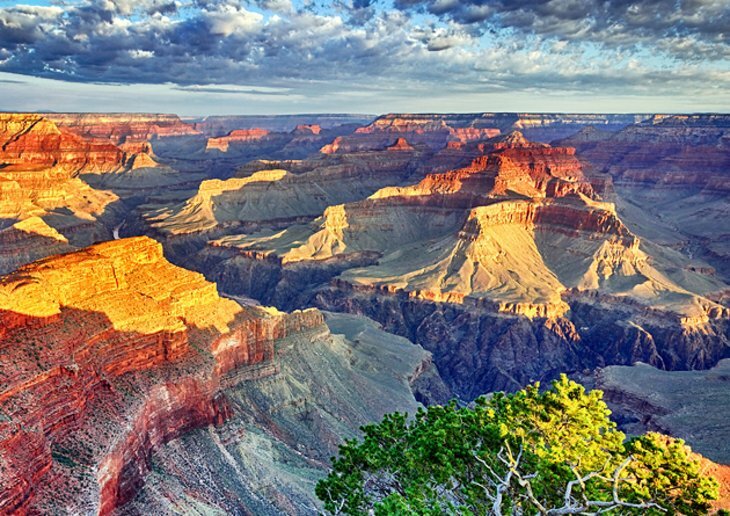 One of the Top Arizona Attractions is the spectacular Grand Canyon. This incredible landscape, carved out by the Colorado River, reveals the power of nature and and the wonder it can create. The canyon walls glow a variety of colors in the late afternoon sun, with hues of orange, red, yellow, and everything in between. Most visitors see the canyon from the South Rim, where there are numerous lookout areas all along the road and walkway running along the canyon’s edge. The North Rim provides a different view altogether, but the road is closed in winter. For those who want a closer look, t is possible to hike down into the Grand Canyon or take a helicopter flight over and through the canyon. The Glen Canyon National Recreation Area is a stunning area of blue water, desert landscape, and dramatic stone walls, making it one of the Top Arizona Attractions. 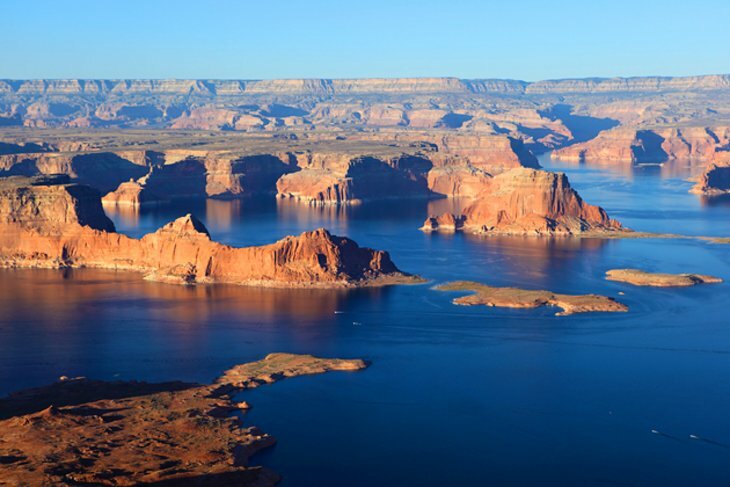 In addition to Glen Canyon, the area is also home to Lake Powell, one of the largest manmade lakes in the United States. The Glen Canyon Dam was constructed between 1956 and 1964 to block the Colorado River and create Lake Powell. There is still a 15 mile section of Glen Canyon downstream from the Glen Canyon Dam, which stretches from the dam down to Lees Ferry. The town of Page is a good base for exploring the Glen Canyon National Recreation area and surrounding region. The largest marina on Lake Powell, Wahweap Marina, is located just 7 miles north of Page. One of the area’s biggest attractions is the nearby slot canyons of Antelope Canyon. 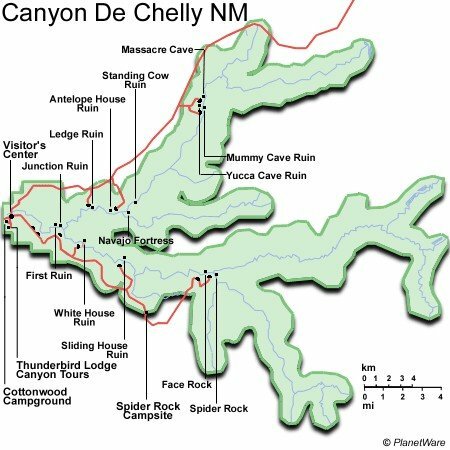 Depending on the section of the canyon, visitors can either simply walk through a narrow slot canyon with shafts of light penetrating through the top, illuminating the red walls, or repel down into a canyon. Photos of Antelope Canyon are often found on postcards or in fine art galleries. 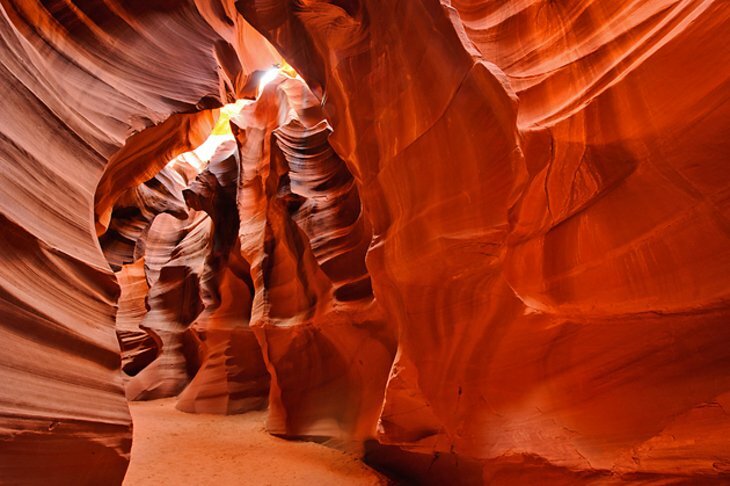 Visitors can visit Antelope Canyon on a guided tour. Monument Valley Navajo Tribal Park straddles the border between Arizona and Utah. 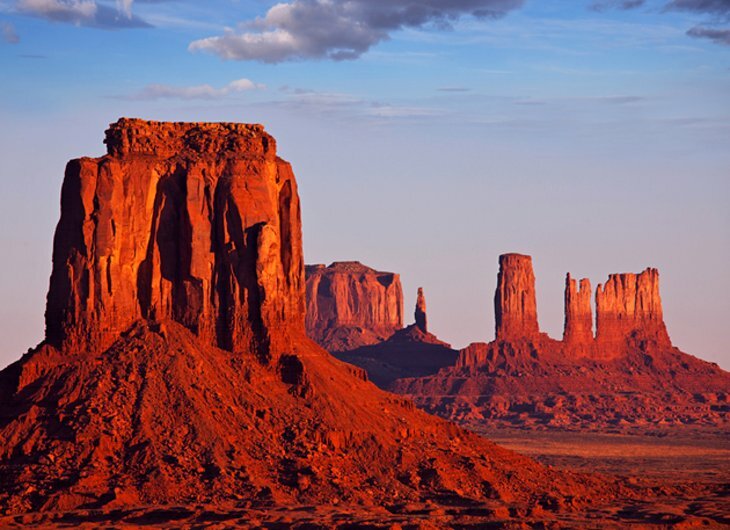 The impressive Wild West landscape includes jagged rock formations, dramatic buttes, and sand dunes. Visitors can do a self drive tour through the valley, take a guided tour or photography tour, or simply appreciate some of the views from the passing highway. 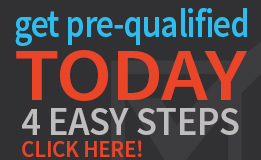 Hoover Dam is one of the world’s great engineering marvels and thus one of the Top Arizona Attractions. 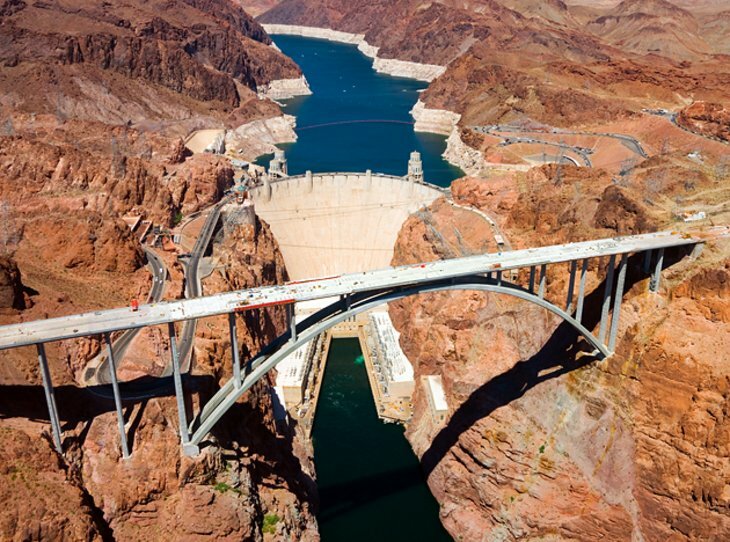 This massive structure, completed in 1935, crosses the Colorado River, linking Arizona and Nevada. It is 726 feet high and 1,244 feet long. 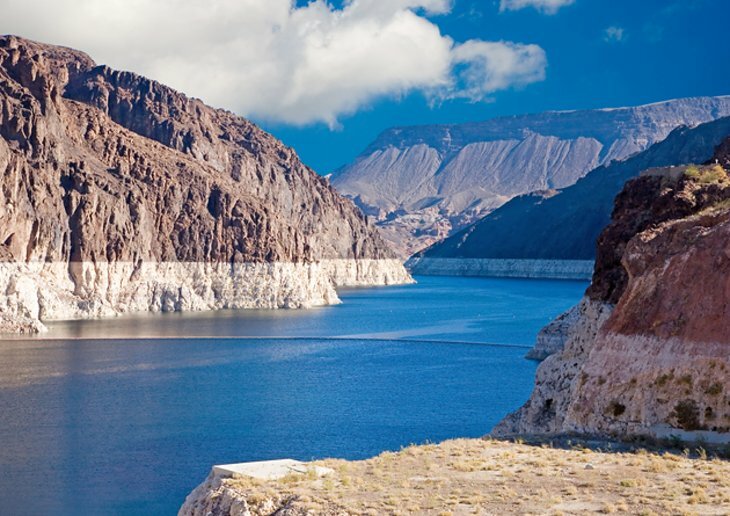 Lake Mead, held back by the Hoover Dam, is the largest artificial lake in the United States. It is 110 miles long, and holds the equivalent of two years of flow of the Colorado River. 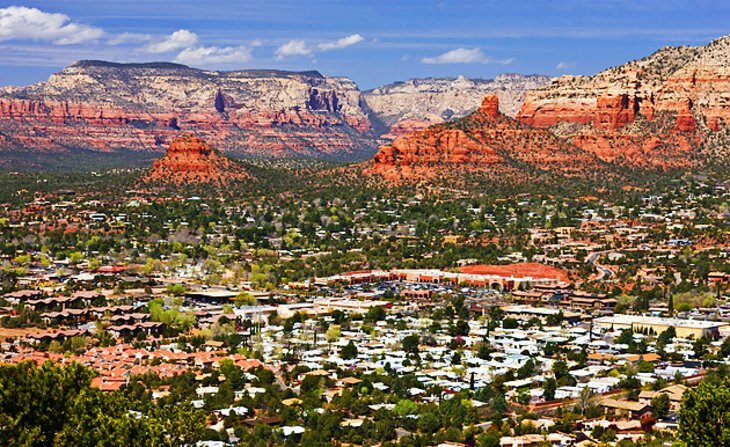 The town of Sedona, about an hour and a half drive north of Phoenix, is situated in a stunning setting, surrounded by red rock mountains and buttes, making it one of the Top Arizona Attractions. There are fabulous views from the main highway running through the town and almost every street corner. The area has great hiking and mountain biking, but jeep tours provide an even easier way to get out into the landscape. Sedona is known for its energy vortexes and many people consider it to be a highly spiritual place. Located along a mountainside high above the desert floor, Jerome is an old mining town, turned ghost town, turned tourist attraction and now one the Top Arizona Attractions. A steep hill with switchbacks is the main street through town, and where visitors will find interesting stores and restaurants. Views from the streets and some of the shop windows are amazing. Many of the old buildings have been renovated but some still stand as ruins, creating a very interesting dynamic. This town is a popular day trip from Sedona, Prescott, Phoenix, or Flagstaff. There is also accommodation for those who want to spend the night. 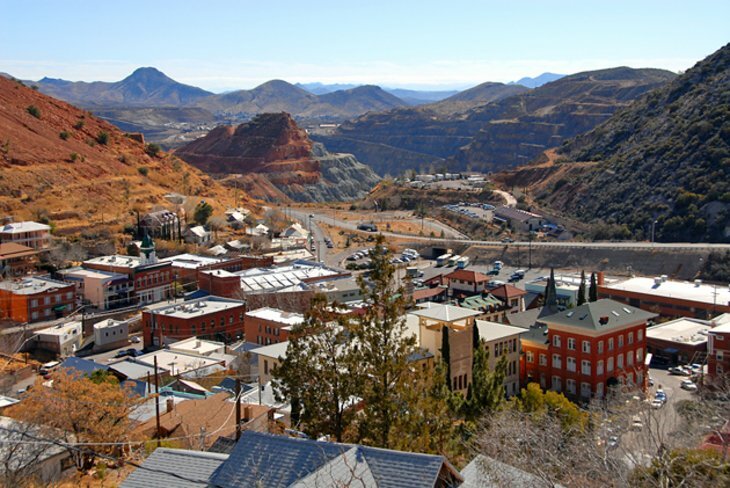 The town’s history can be appreciated at the Gold King Mine Museum and the Jerome State Historic Park. This town is unique to say the least, and has many interesting and quirky sites. The Sliding Jail in Jerome was originally built around 1928. Built on a clay slick, it soon began to slide and now sits 2,500 feet from its original location. The Jerome Grand Hotel, built in 1927, is the highest public building in the Verde Valley, and it offers breathtaking views. The Bartlett Hotel was once one of Jerome’s finest hotel but today stands in ruins. 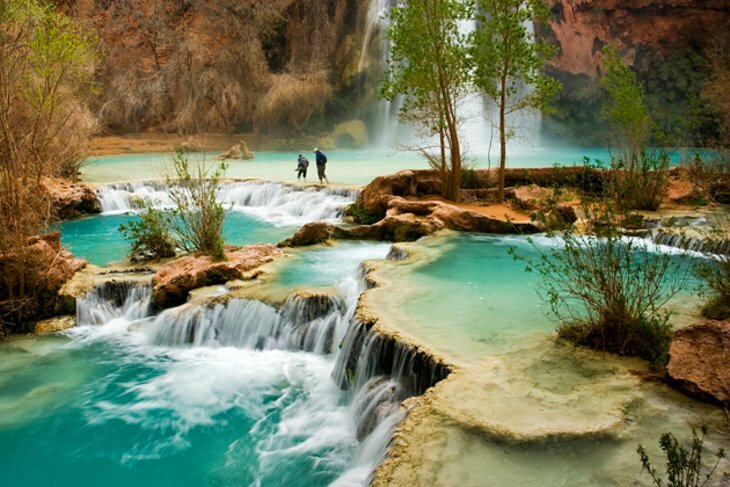 Near Supai on the Havasupai Indian Reservation is the 100-foot Havasu Falls. The pools at the base of Havasu Falls have a bluish green tint to the water, and the fall is forked so it appears that there are two falls when the river is flowing heavily. In the canyon of Havasu Creek, a tributary of the Colorado River, some 450 Havasupai Indians (the “people of the blue-green water”) live a secluded life, subsisting on their modest farming activities but now mainly dependent on the tourist trade. In this paradisiac valley the Havasu have created a number of waterfalls and carved out basins in the travertine rock which form attractive bathing pools. CHECK OUT THESE BEAUTIFUL HOMES IN THE PHOENIX-METRO AREA FOR UNDER $250K! 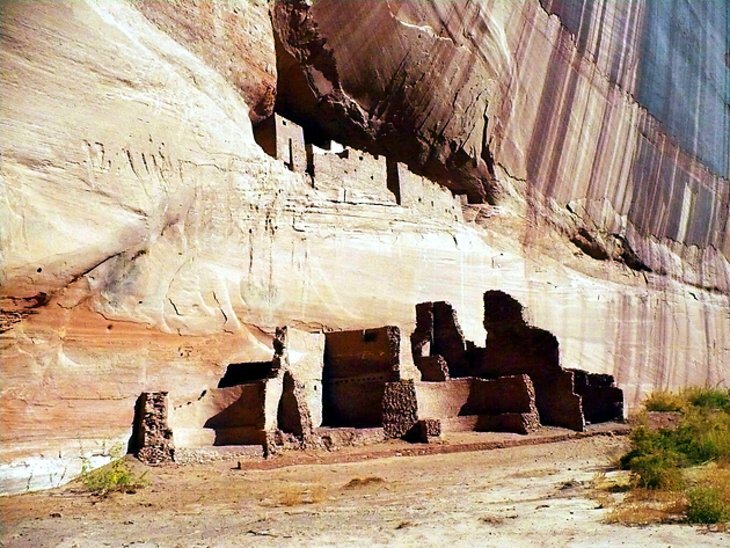 The Canyon de Chelly National Monument is home to spectacular cliff dwellings found on and at the base of steep-sided canyons up to 1,000 ft deep. In the main canyon are Spider Rock, a striking rock formation, and the White House, constructed c. 1050 and discovered in 1849. This is the best known of over a hundred cliff dwellings, mostly in inaccessible locations, which were occupied from around AD 350 to 1300. Other cliff dwellings are the Antelope House and Mummy Cave (in which mummies were found) in the Canyon del Muerto. There is an informative archeological museum in the Visitor Center, and there are various guided tours and walks. In the far south of Arizona near the Mexico border is Bisbee. This former mining town is set high in the mountains, with views that extend over rolling terrain to Mexico. Homes, many of which are former miners cabins, line the hills which surround the historic downtown area. 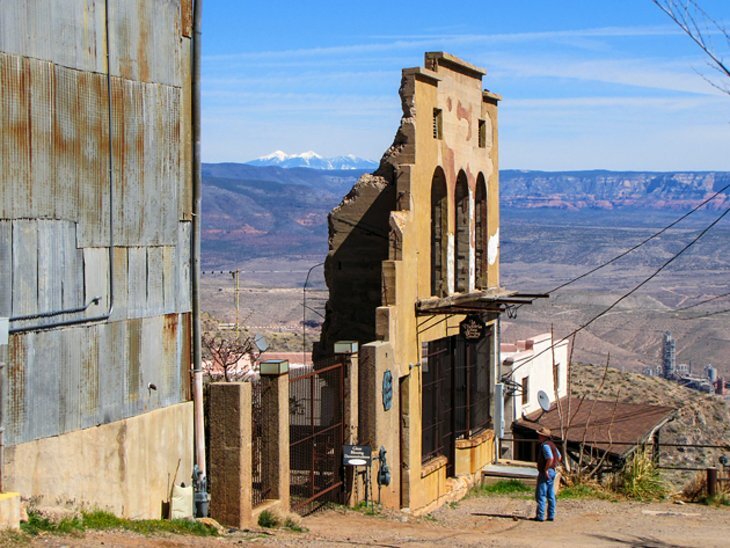 After the mines closed Bisbee became a ghost town and squatters took up residence. Eventually the town became a haven for artists and hippies. Today it is a prosperous little community with an eclectic mix of people living here, unique shops lining the old main street, and many interesting things to see. This is a popular day trip from Tucson and surrounding areas, often combined with a trip to Tombstone. Lake Mead National Recreation Area spans 177 miles of the Colorado River, including Lake Mead and Lake Mohave, making it one of the Top Arizona Attractions. The area’s 1.5 million acres stretches into southern Nevada. The area offers boating and watersports, camping facilities, fishing, and hiking opportunities. Lake Mohave is 67 miles long, making it the smaller of the two major lakes in the Lake Mead National Recreation Area. Like its counterpart, Lake Mohave is an artificial body of water, held back by Davis Dam. Willow Beach is a small resort town on the Colorado River with accommodation, restaurants, marina and fish hatchery. 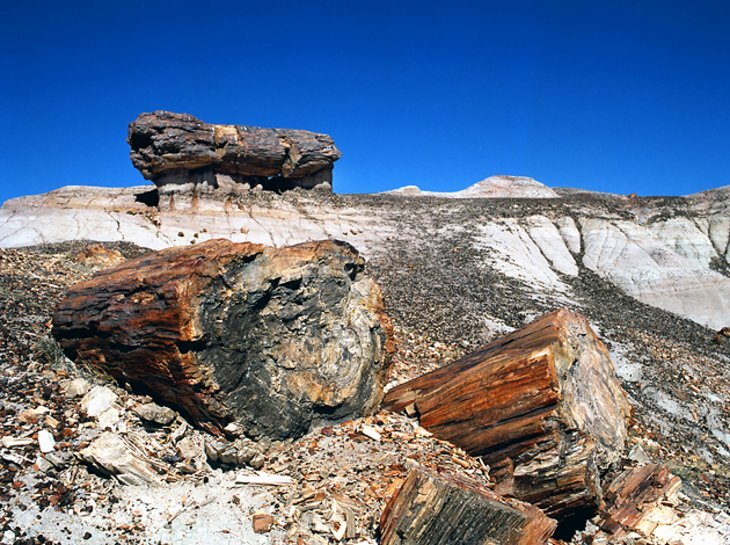 Large pieces of petrified wood, along with fossilized plants, fish, and reptiles, have been revealed in great numbers in what is today Petrified National Forest in the Painted Desert. The park access road allows visitors to drive passed many of the highlights and short interpretive trails allow for close up looks at a variety of unique sights. The Visitors Center provides insight into the ecology and geology of the park and is a good place to start before heading out on the drive. 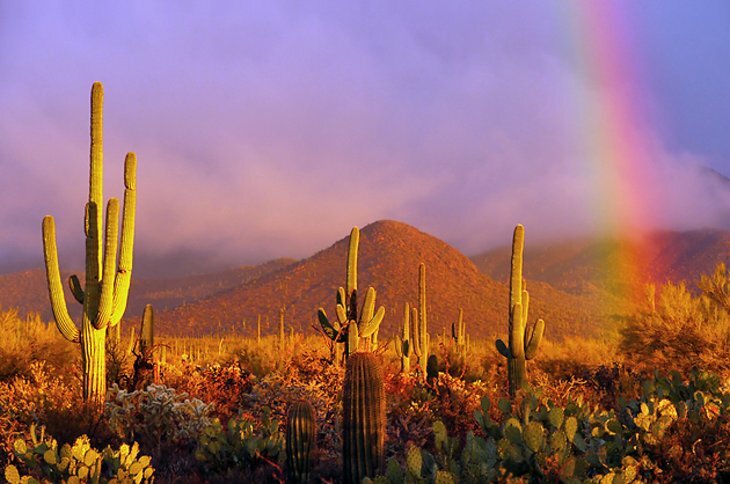 Saguaro National Park is a great place to experience the desert landscape around Tucson and see the famous saguaro cacti up close, making it one of the Top Arizona Attractions. The park has two sections, an east and a west portion, located on the east and west side of Tucson, approximately a half hour drive apart. Both offer great opportunities to see the desert flora and fauna with roads and hiking trails. There are also challenging hiking options available with trails that lead up into the high mountains, reaching up to 8000 ft in elevation. Visitors can visit both sections of the park on the same entrance ticket or park pass. 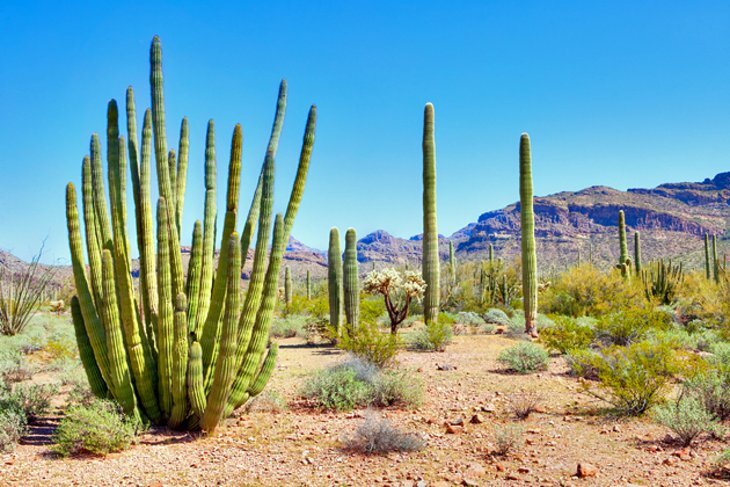 In southwestern Arizona, on the frontier with Mexico, is Organ Pipe Cactus National Monument, with three distinct desertic vegetation zones and some 30 different species of cactus. However, the park is famous for the organ pipe cactus, which grows up to 23 ft high, and blooms from May to July. Because of the great heat during the day it opens up its flowers only after sunset. The area can be explored on various roads and hiking trails. There are two scenic drives of note; the Ajo Mountain Drive, and the Puerto Blanco Drive. Tumacacori National Historical Park, located south of Tucson, preserves the ruins of three early Spanish colonial missions on 47 acres in southern Arizona. San José de Tumacácori and Los Santos Ángeles de Guevavi were established in 1691 and are the two oldest missions in Arizona. The third mission, San Cayetano de Calabazas, was established in 1756. The site was abandoned in 1848 due to Apache raids, neglect, and a terrible winter. 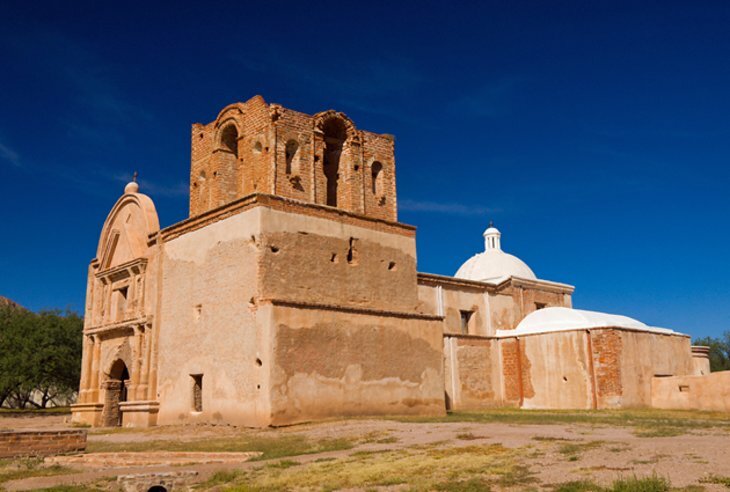 Tumacacori became a national monument in 1908 and the two Spanish missions, Guevavi and Calabazas, were added to the site in 1990. Antelope Canyon, just outside of Page, is a slot canyon and very popular photography location, making it one of the Top Arizona Attractions. Photos of Antelope Canyon can be found in almost every major gallery in Arizona. There are two parts to the canyon, Upper and Lower. Visiting each location requires a guide and there are a variety of tour options available. The canyon lies within the Navajo Nation reserve boundary.